To receive Justice for civilian, military and military dependent peace-keepers that were wounded as a result of toxic chemical poisoning at Camp Lejeune, North Carolina. The following is taken from this report and is not in order and is not the complete report. For a copy of the report contact the Agency for Toxic Substances and Disease Registry. 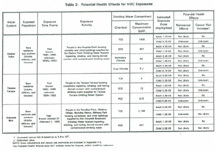 In the past, the Tarawa Terrace, Hadnot Point, and Holcomb Boulevard water distribution systems on base were contaminated with volatile organic compounds (VOCs) )(see table 2). The sources of contamination were leaks from off-base and on-base underground tanks, some of which were installed in the 1940s. VOCs make up a group of chemicals having similar physical properties. VOCs readily evaporate or volatilize into gases when exposed to air. Chemicals in this group include trichloroethylene (TCE), dichloroethylene (DCE), tetrachloroethylene (PCE), ethylene chloride, and vinyl chloride and in general my us used as dry-cleaning solutions, additives in fuels, or as solvents to dissolve grease or other compounds. Tap water sampling in the Tarawa Terrace water system in May 1982 detected PCE at 80ppb, a level that remained consistent during the July sampling. 1,2 DCE was detected at 12ppb,. Trace amounts of TCE were detected, but because of the laboratory instrument detection limit of 10ppb: TCE was estimated to be 8ppb. At the time of the 1982 sampling, no source for the contamination at either Hadnot Point or Tarawa Terrace system had been identified (31). Furthermore, there were no drinking water standards for these chemicals in 1982:TCE, PCE, and 1,2 DCE levels in drinking water were not regulated until the Safe Drinking Water Act was amended in 1991 (32). Sampling in February 1985 detected PCE at 215 ppb. Table 2 shows the maximum detected concentrations of VOCs at the tap and the current drinking water standard, referred to as the Maximum Contaminant Level (MCL) allowable. Subsequently, it was determined that contamination at the Tarawa Terrace distribution system was caused by an off-base dry-cleaning operation (ABC Cleaners) whose septic system released the cleaning fluid PCE into the ground (33). The septic system was installed in 1954 and used until 1985. In 1985, a well supplying the Tarawa Terrace system was drilled approximately 900 feet from the dry-cleaners. Because the well was so close to the septic field, the well was probably contaminated soon after it was built. That well could have contaminated the water distribution system with PCE for as long as 30 years. Over time, contaminants migrated into a second well, located approximately 1800 feet south of the septic system, but the PCE contamination was detected before this well was put into use. In 1985, both of these contaminated were shut down (31). Unable to meet the increasing water demand without those wells, the Tarawa Terrace distribution system was closed (28). This public health assessment evaluates exposures that occurred during the time for which sampling data are available. However, the ATSDR study of birth outcomes reviewed available birth records over the longer estimated duration (1958-1985). In July 1984, as part of the Navy Assessment and Control of Installation Pollutants (NACIP) Program, MCB Camp Lejeune conducted water quality sampling in wells on base. They found that eight of the 39 wells in use at Hadnot Point and one of the seven wells in use at Tarawa Terrace were contaminated with VOCs. All nine wells were abandoned and have not been used in the drinking water system since 1985 (28). On January 27, 1985 a generator fuel line at the Holcomb Boulevard water distribution plant burst, leaking fuel into the system. This situation was identified after the base received complaints of a gasoline smell in on-base residential tap water (31). MCB performed sampling of the system and found that gasoline had entered the Holcomb Boulevard distribution system. The system was immediately shut down and flushed out. Emergency back-up water was them pumped from the Hadnot Point system, whose VIC contamination was not yet identified, into the Holcomb Boulevard distribution lines. Tap water samples taken from Berkeley Manor Elementary School in the Holcomb Boulevard system on January 31, 1985, contained TCE at 1148ppb and DCE at 407 ppb (Table 2). Contaminants measured at several points in the Holcomb Boulevard system were consistent with samples taken from the Hadnot Point Water treatment plant on the same date. Therefore, the source of TCE and DCE in the Holcomb Boulevard system originated from the contaminated emergency water supplied by the Hadnot Point system. People were switched back to the clean Holcomb Boulevard system 12 days later.